I saw this on Wikipedia. (see attached screenshot). Because of this would there be any problem with buying a Mazda? This would not pose a problem with buying a car from this company. The reason is that the car would only be problematic if it were to service the avoda zara, but not if it the name of an avoda zara. 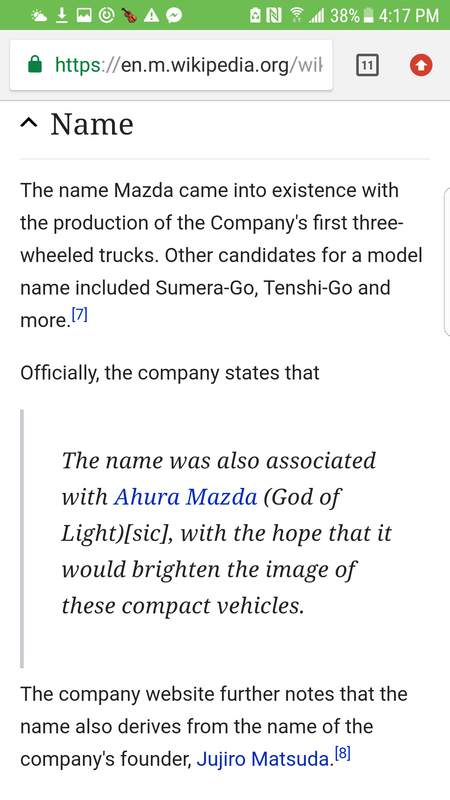 Even saying the name Mazda would not be a problem because we are not referring here to an avoda zara, but to the name of type of car. Besides, the company says that they gave it this name for other reasons too, such as the name of the owner of the company. BUying from a thrift shops that is run by a church. Not what you're looking for? Browse other questions tagged Idolatry avoda zara idolitry or ask your own question.